Spike III seems to be new raising star in Divison 6. After one season it is sporting Claw, Piling on, Mighty Blow, Block, Tackle and Pro already. All he needs now is a niggle and a broken paw. But until then lets celebrate his success. 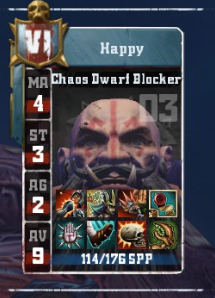 In the week 2 game against High Elfs he broke armor 12 times in 12 blocks, knocked out 4 players and made one High Elf lineman family very sad. His team is doing well so far and Spike is going to be big asset in the fight for playoff spot. That, or big puddle of blood on the pitch after someone rewards his piling on attemps with a boot. As they should. Update: I am have been informed Spike III comes from Free Agent so it now makes little more sense. Another Piling On, Claw, Mighty Blow, Block, Tackle and Pro piece. This one with Jump Up on top and showed just a little bit more effectivity than the Skaven blitzer. In 11 blocks, he broke armor 14 times. Only one knockout was heavily outweighed by 3 casualties, including one dead tasty Orc Blitzer with Block, Mighty Blow, Guard and Tackle, and miss next game for Jump Up Black Orc. Yes, you read that right, we have jumping up chorfs and black orcs. What a treat. At least someone in DIV1 thinks about us poor elfs. On the other hand I get my first hand Happy experience in about 2 weeks. Yay. 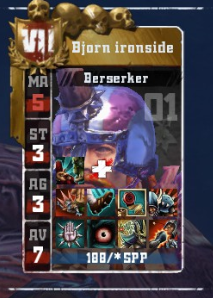 While all others players in this week article are renown for their killing expertise, this one Bretts Blitzer from fresh division team displayed that not only killers make this leaderboard. The rest of his team was likely still on a summer vacation, so Lancelot decided to be the guy in the group project, that does everything. In 7 blocks he broke armor 3 times, knocking out one, and injuring another player. 2 passes, 1 catch and scoring a touchdown were supposed to crown him as a man of the match. But as in every group project the MVP was grabbed by his teammate Dave, who did nothing apart getting punched in the face 4 times, and getting 3 stuns and being injured in the end. Typical. Bjorn felt like at home in this section of G-Manual last season with about 3 or 4 appearances. He must have felt like little kid in a toystore, roaming around Amazons with their AV7 with all his kill skills. 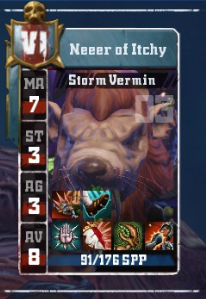 Despite being Gman legend already and being movement busted, Bainsy is still feeding him the victims. And he made the most of it. 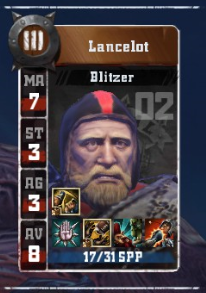 As primary blitzer he limped his way to 16 blocks and 11 armor breaks. These resulted in knocking out 5 amazons and killing 1. It was just some poor linewoman though, so apart getting few threats about being sexist sent to him, no one really cared. After recovery season 8, Nooblets were able to win both games this season, and are currently in the front rows of divison 3 leaderboard. Last week Neeer of Itchy set himself on the route of carnage later than he would have liked. However it seems that he picked up exactly where he left for his week 2 game. This time equiped with Tackle. 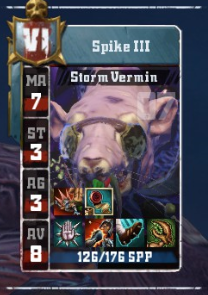 His team faced another Skaven team, that was admittedly better suited for killing. Not after the game though. Neer was able to pump up his week 1 numbers and injured 5 opposing players and knocked out another 2. He achieved that in just 11 blocks and mind-boggling 17 armor breaks. And the injuries were ones to stick. One of the Primetime Nibblers blitzers got armor bust to his niggle. And then he granted the benefits of niggling injuries to Sunfire - the star of the team. Movement busting linerat, breaking ribs of another one and badly hurting last one seemed like underperforming in comparison. I will get the honours to have Neeer doing his business on my team in week 3 so I hope he spent all his injury dice on this game. See you next week with fresh batch of Star Players to curse.